Key to the City of Vancouver's new Zero Emissions Plan is a heavy focus on the building envelope and conversely the Passive House standard (which uses EUI or Energy Use Intensity as their standard). There is also a new Thermal Energy Demand Intensity (TEDI) envelope and ventilation target which functions much the same way as Passive House, so for this post we need not focus on TEDI. If they adopt either of these standards they will be the first municipality in North American that will trade an energy efficiency standard for one based on intensity. Make no mistake, TEDI and EUI are not a measure of energy efficiency and efficiency is what anyone working in green buildings would say is of most value. Air tightness is a double edged sword. While sealing an orange inside a zip lock bag will likely keep the cold air out of the bag, it seals in the moisture and that orange rots much faster than if you hadn't put it inside the bag. Make no mistake, we feel that the building envelope is important. Almost all building energy standards put a focus on building envelope efficiency including ASHRAE, the Model National Energy Code and others. However we question the merit of a standard the focuses so heavily on building envelope without accounting for indoor air quality, mechanical equipment effectiveness etc. To have a Passive House certification, a building has to meet three criteria. The first is that a building has to be completely airtight to ensure no hot or cold air are escapes, cutting down on energy needed for heating and cooling. The second is the annual energy consumed for heating and cooling must not exceed 15 kWh/sm/year (EUI measure). Thirdly, the total energy consumed must not exceed 120 kWh/sm/year. [they] don’t know how to do air conditioning or [deal with] humidity. For some context the number of air changes per hour (ACH) on a hospital (per CSA requirements for contamination control) is 10 ACH. That means every hour a space will get a complete exchange of stale indoor air for fresh outdoor. This helps control contaminates and makes for very good indoor air quality. In Passive House the building can have no more than 0.6 ACH. While we recognize that a home is not a hospital, most people would likely choose good air quality over potential energy savings. That certain health complaints are more prevalent with heat recovery ventilation systems. The percentage of health problems almost doubles in every case compared to a conventional mechanical exhaust system. These health issues could be in part due to the condensation and mold build-up that often appears in HRV systems filter. HRV filters need changing every 6-12 months, which is often overlooked. It’s not necessary a criticism of HRV’s but more likely a result of unfamiliarity within the residential sector where most people are used to operating a very simple boiler. When implemented in North America, often [the] results are buildings that aren’t cost-effective. These Passivhaus buildings have insulation that is so thick, and windows that are so expensive, that the cost of the insulation and window upgrades is much higher than the value of the energy that will be saved by these upgrades over the life of the building.” Compared to “places with expensive energy, everything was affordable in a sense: even [envelope] measures that were deep into diminishing returns still showed cash flow. In places with cheap energy, distressingly little was affordable.” Building owners and occupants likely won’t see a reimbursement during the building’s lifetime, and it may be hard to get stakeholders on board with Passive House. In Vancouver, building a Passive House would likely have a very long return on investment. Vancouver has one of the mildest climates in North America (both a low heating load and a very low cooling load). 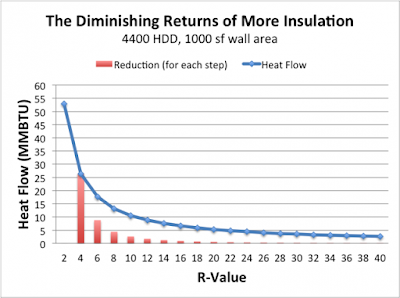 The National Energy Code and ASHRAE rarely set the R value in their standards to higher than about R-15 as the value of insulation after R-15 is pretty minimal. One part of the Passive House energy standard that is particularly problematic is the use of EUI (Energy Use Intensity) as a design target. Energy Use intensity has risen in popularity because it is a simple single number that can be easily remembered. 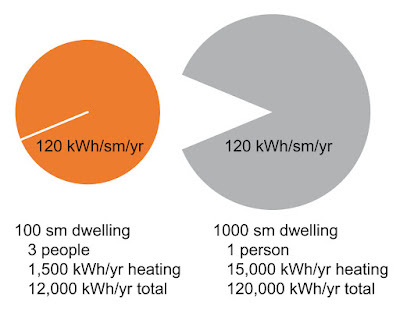 For Passive House it's 120 kWh/sm/year. The problem with EUI is that as a measure it is only really useful for portfolio management. If you had 20 houses all the same size with the same number of people in them, then a house using 400 when the rest are using 120 means that something is wrong with the house using 400. The challenge with an intensity number is that the same drop of energy (kWh) in a big bucket (square meters or sm) can make it look like a building is energy efficient. 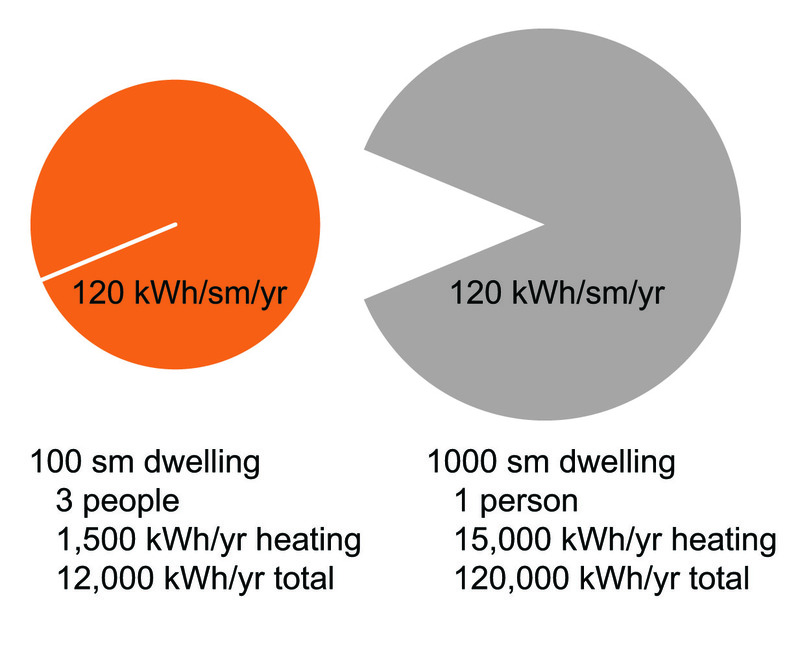 If we do a 100 sm (about 1,000 square feet) Passive House with a family of 3 in it and the total energy use is 12,000 kWh a year then this house meets the standard of 120 kWh/sm/year. But now we take a McMansion of 1,000 sm (or 10,000 square feet) with a single home owner who is rarely home and their energy use is 10 times that of the family of three and his EUI is the same he also complies with Passive House. The negatives of Passive House or any envelope focused standard seem to outweigh the benefits in Vancouver. The scope of Passive House’ regulation is limited and rigid compared to LEED certification which gives flexibility to achieving energy efficient buildings. The City of Vancouver cannot disregard the importance of water savings, material selection, transportation and location requirements that their current standard takes into consideration to improve overall sustainability. We would recommend staying with the current standard and applying it to more building types or increasing the efficiency threshold for each building type. 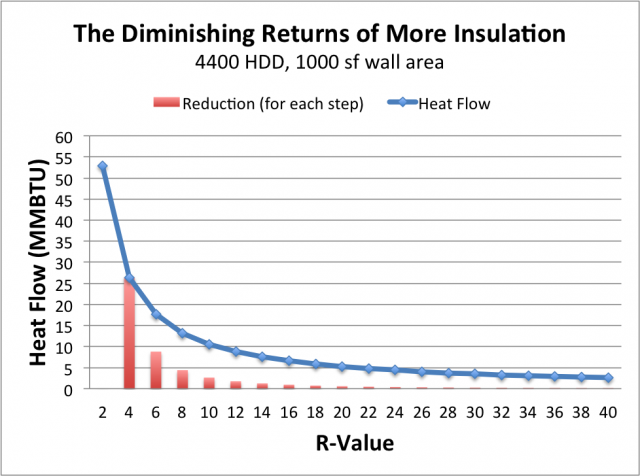 Right now for rezonings of part 3 buildings, a project needs to be 22% better than ASHRAE. Making that a requirement of non-rezonings or increasing that value is likely going to be much more effective than changing to a standard that is not focused on energy efficiency. The industry is familiar with ASHREA. In fact the standard is the duty of care for design that all engineers in North American are held to. It addresses energy efficiency, domestic hot water etc and has been very effective throughout it's 41 years in practice. The CaGBC and USGBC (and their partner ASHRAE) all use the City's current standard and we are sure would work as effective partners to continue to further drive down GHG in the City of Vancouver. While there is no perfect solution to reducing our environmental impact, Passive House and the rest of the Zero Emissions Plan is certainly not the best choice for Vancouver to lower it's greenhouse gas impact.